A guide to fixing posts with anti damage protection.! There can be many accessories/objects that protrude above the layout, but some can be particularly susceptible to destruction as they have very thin bases that can be snapped off or bent very easily by an unintentional swipe or nudge. The obvious tendency to simply drill a hole in the baseboard and push in, results in odd angles a vulnerability to damage! I was scared to glue all the posts and lamps/height gauges/water cranes to the base board, for fear my clumsy elbows would inevitable smash them down with irreparable damage. So applying the same principle as my removable buildings/platforms/bridges etc, I devised a resilient fixing system. So here is the method to protect against harm. Can be applied to Height gauges, telegraph poles, water towers, power pylons, flag poles, power poles, (non lit) street lamps, etc. Drill a hole in the base board. 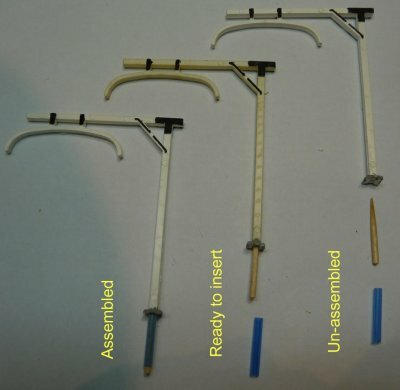 Insert and glue some plastic tube (namely plastic cotton bud stem or alternatively hollow plastic lollipop sticks) into the hole, ensuring it is at right angles to baseboard, insert a cocktail stick as a temporary post to ensure the tube is perpendicular. Now carefully drill a 2mm hole (true) up the post for 10mm. 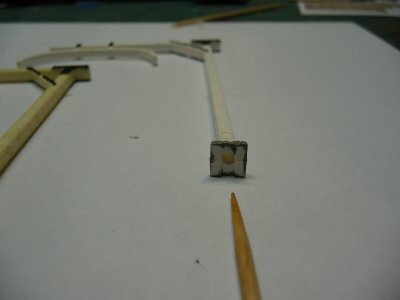 Cut a cocktail stick short and insert pointy end in post (glue not needed) and insert assembly into the sleeve of the hole in the layout. An alternative to the toothpick (tends to snap off when attacked, but is replaceable) is a piece of solid copper wire (2.5mm CSA as found in 2.5mm flat twin and earth) which simply bends when the post is abused, so can simply be straightened out.